Almost every Sunday morning I go to church and then to the market. It’s a regular routine I’ve had for at least 20 years. It started when my kids went to CCD after Mass and I had an hour and fifteen minutes to kill before I had to pick them up. It worked out fine as I would be able to shop on the first day of the sales and have fresh food to pack lunches for the week. The kids are grown and live elsewhere but I still go to the market Sunday mornings. I typically see some of the same people there every week. Evidently it’s their routine as well. Usually I see one of the office people from my doctor’s office there with her husband. Sometimes we just say ‘Hi” and other times we talk for a few minutes. The last time I saw Sherry she remarked that she really liked my hair and asked who cut/highlighted it. She went on and on about the color and style. I hadn’t done anything different to it for a several weeks but she was sure I changed something. My old glasses just disappeared on my face. Silhouette Titan Dynamics. My new glasses don’t. 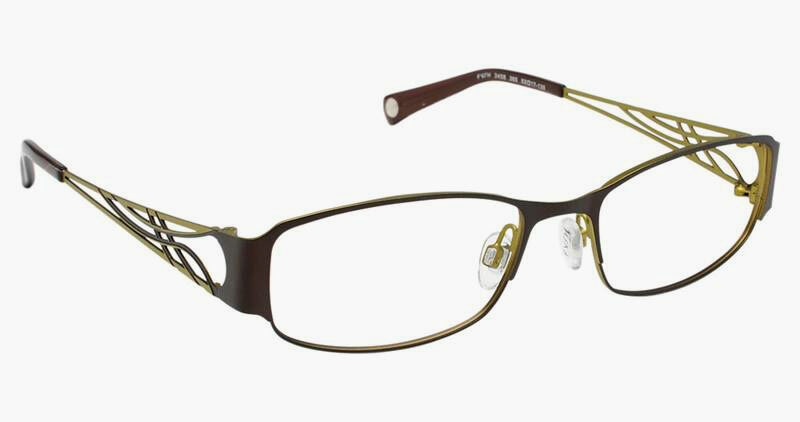 Fysh Urban Eyewear #3458 brown and lime. I love them. Maybe I’ll let you see them on my face sometime. This entry was posted in Random and tagged eye glasses, eyewear, hair, random thoughts by Patti_is_knittinginflashes. Bookmark the permalink. Bike trip to South Carolina? While I’d love to see you in person, I think a photo will be more realistic for now.